Why wait to thank God it's Friday?! Start one day early with this delicious and refreshing Italian mountain wine. Alto Adige wine region is just south of the Austrian border. Abbazia di Novacella is located in Alto Adige, a 3,000 year old alpine winemaking area at Italy's northernmost point. Many diverse peoples settled and influenced the region during the course of time and there are now three official languages spoken here today: Italian, German and Ladin (the language of the Dolomites). This mountainous region has terraced vineyards planted up to 2,200 feet above sea level against a dramatic background of snow-capped Dolomite mountains. The soil for the wines is mainly granitic schist created by ancient glaciers. Founded and still operated by Augustianian monks, Abbazia di Novacella is one of the oldest wineries in the world with 850+ years of winemaking. Famous for crisp, pure, and mineral-driven whites (Sauvignon Blanc, Pinot Bianco, Chardonnay, Kerner, Sylvaner, and Gewürztraminer), the estate also receives acclaim for its aromatic Pinot Nero and other “formidable reds” like Lagrein and Schiava (Wine and Spirits Magazine). Abbazia di Novacella practices organic farming. 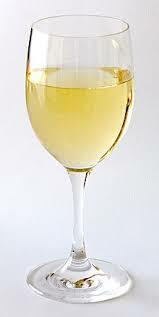 Color: Darker than expected for a Pinot Grigio, with a brilliant straw yellow, almost golden, color. Aroma: One whiff and you'll be hooked! The smell of citrus fruits, peach, and honeydew melon will draw you in and lead your lips to the glass. Palate: Medium-bodied with a round and slightly creamy texture and a mouthwatering, fresh fruitiness that ends in a pleasing, slightly bitter, long finish. Notes of green apples, peaches, pears, and herbs. Alto Adige wines are very food friendly. I had the Abbazia di Novacella with a strong Limburger cheese and it went brilliantly! You can sip on this wine as an aperitif, or pair it with any of the following: fennel and orange salad, fondue, pasta, grilled sea bass, marinated squid salad, poultry dishes or Roast Pork Loin With Apples. In NYC: Try Astor Wine, Some Good Wine and Nolita Wine Merchants. Outside of Manhattan? Go to wine-searcher.com to find the wine near you or where to order online. 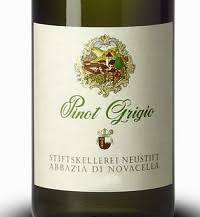 And don't forget to ask for Abbazia di Novacella in your favorite restaurant.